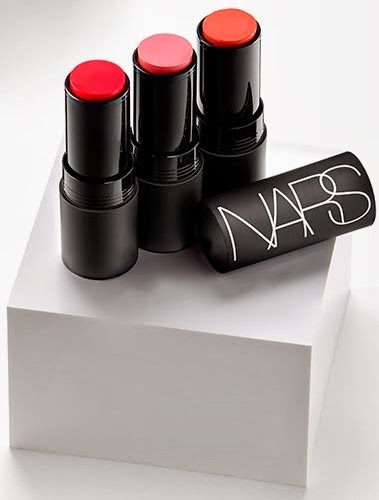 In passing I had heard about the new Nars Matte multiples but I didn't really think that much about them. I had seen and tried the regular Nars multiples but they never really worked for me. So I figured these would be something similar. Then today I got an e-mail advertisement from Sephora and I was just blown away by the gorgeous promo pic of them. I immediately clicked on the "shop now" and I was heartbroken to see they were already sold out! How could I have missed these; I didn't think they were even available for another week! I kept checking the Sephora website all day today and I was overjoyed to finally see six of the seven matte multiples are now available for purchase (see promo pics below). I guess Sephora just hadn't had time to update their website before the e-mail ad was sent out. Anyway, I want at least three of them maybe four. I'm still on the fence about Siam - does it lean more orange/red or pink/red. I mean it is a beautiful red but I'm not sure if it will work for me. I will be sure to post swatches, pics and my review of them as soon as I've tried them so check back or leave me your thoughts / review on them below in the comments section. I'd love to hear how it works out for you! The Matte Multiple is safe to use wet or dry on the lips and cheeks. Use dry for a vibrant flush of color.